An observer is someone who is the true witness of each and every event and immortal means one who is eternal and has no limits in time, i.e., one who don’t have past, present or future. Then, who is the eternal witnesses who silently observes everything; all the time and associated with everyone and present everywhere? Let us explore this with the help of pure reasoning and logic, i.e., Philosophy. We the human beings are curious by nature and at some point of time in our life most of us may have asked ourselves some questions which is quite very philosophical and don’t have any satisfactory answers. Is death is the ultimate end? Well , clearly saying ; science don’t have any satisfactory or, confirmed answer for all such question and also science don’t have any firm answer for consciousness and its existence inside the brain . May be someday science can figure it out but, who knows may be all such questions is not meant to be understood by scientific experimentation. Well, it’s obvious and there are many things which can’t be understood scientifically but, have their own approach of understanding. For example - One cannot measure the beauty of poem by means of any experiment and there is no such scale to do so. Similarly, there is no scale to measure “how hungry a person is?” All such things need a different approach of understanding. So, just because they can’t be explained by scientific standpoint we cannot tell that the poems written by William Shakespeare are meaningless. Similarly, all such questions which keep on bothering us all the time have its answer in Indian philosophy. Though each of the philosophical system provides their answer to all such question in quite similar manner and in pure logical way but, still they are associated with some kind of criticism from other schools of Indian philosophy. Among the six orthodox schools of Indian philosophy; the answers to all such questions provided by the Vedanta philosophy is more compelling and logical. The Upanishads are also called as Vedanta. Currently, we found the list of 108 Upanishads out of which 10 Upanishads are considered as the principle Upanishads. Vedanta Philosophy -: It was preached by Vyasa (Krishna dwapayana) who wrote Brahma-sutras to summarize the Vedanta philosophy. Though people interchangeably use the word “Vedanta” to express both Upanishads and Vedanta philosophy but, both are different in their approaches. Upanishads is the original source which document divine revelations and taken as it is whereas, Vedanta philosophy is a man made philosophy based on the understanding of Upanishads along with some other major texts. Great Indian philosophers like Gaudapada, Govindapada, and Shankara etc. 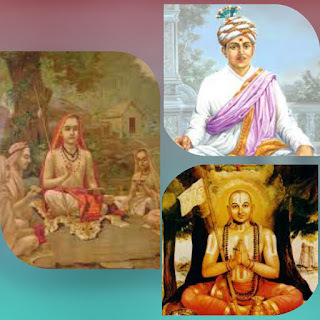 are the pioneers of Advaita Vedanta, i.e., Non-dualism. Among all other kinds of Indian philosophies this sub-branch provides the best logical , reasonable and a firm explanation to all such curious questions that we might have asked ourselves at least once in our life time and mightn’t able to get the proper answer. Advaita Vedanta considers individual self or, soul (Atman) and the absolute (Brahman) together with matter, time and space to be fundamentally the same. This is the basic idea of Advaita Vedanta. Vidyaranya Saraswati is regarded as a great scholar of “Advaita Vedanta” after “Jagadguru Adi Shankaracharya (Shankara)” and he himself was the 12th Jagadguru of the “Sringeri Sarada Pitham” from 1380 AD to 1386 AD. Vidyaranya Saraswati is variously known as a kingmaker, patron saint and high priest to Harihara (I) and Bukka Raya (I), who are the founders of “Vijayanagar Empire”. 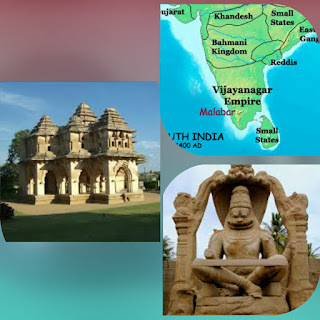 He helped the brothers to establish the empire sometime in 1336 AD and later served as a mentor and guide to three generations of kings who ruled over Vijayanagar (Hampi), the capital of Vijayanagar Empire. Vidyaranya is also known as “Madhavacharya” and Vijayanagar had a temple dedicated to him. He is the author of “Sharva-darshana-sangraha”, which is a compendium of different philosophical schools of Indian philosophy and “Panchadashi”. “Panchadashi” is a comprehensive text of Advaita Vedanta and in this whole discussion on “The Immortal Observer” is based upon 3rd to 10th verse of this eminent text. Here we will explain each verse one by one from 3rd to 10th and as we move from one verse to the other, the meaning of the immortal observer will be unfolded likewise. Therefore it is needed to understand each verse clearly before moving to the next. Here we are not going to discuss any illogical or unreasonable situation rather each explanation contains situations of our day to day life and critically analyze each of them. So you need to impart all such situation with your day to day life and then analyze the explanations. Remember philosophy also needs your own point of view and reasoning capability. Hence, feel the explanation and indulge yourself in this beautiful exploration. The word “Sambit” means “Consciousness”. Here, the verse says to observe our day to day life. When we see a house, the light reflected from the house come to our eyes and then the picture of the house goes to our mind and it is the consciousness which enlightens that picture and generate some thoughts or, ideas about the house. Similar process happens with other objects around us, as well, like laptop, car, dog etc. Each object has its own characteristic thoughts associated with it but, the consciousness which enlightens these objects and produces thoughts related to it is one and the same. For analogy take “light”. We may see different objects with different shape , size and color but, it is the same light which gets reflected from different objects . Therefore, experiences differ because of the objects associated with the experience are different, but, it is the same consciousness which illuminates all experiences. In the dream also we have various experiences and we are unaware of the fact that we are dreaming. Here also, it is the same consciousness which illumines our dream experiences. So, that which illumines our waking world and that which illumines our dreaming world is one and same, i.e., “CONSCIOUSNESS”. immortal is nothing here. Only soul, which too when changes bodies, made to forget everything. Seeking the eternal! Yes , i am talking about consciousness which is eternal.. Soul is what we call "jeev-atma" which is driven from one body to another body by the law of karma. When that soul knows the immortal observer (self or, consciousness) then, it gets the enlightenment and became free from the cycle of life and death.. It is the maya (illusion) which creates all such turmoil of mortality but the real self or, consciousness is eternal.